Savra, Queen of the Golgari - Commander of the first EDH deck I built from scratch, which is still a formidable attrition style deck. Runs a convoluted, but very resilient, infinite combo as an emergency finisher. Toshiro Umezawa - Commander of my highest-rated deck here on EDH, I've put a lot of time into making his list run smoothly and the primer I have here is the result. 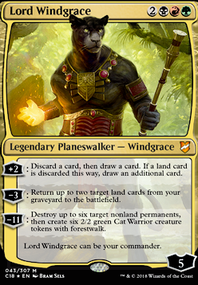 Neheb, the Eternal - Commander of my most fun deck. He makes so much mana, and can have unbelievably explosive games, finishing people off with almost nothing in play. My favorite moment with this deck was killing a player from 40 with the exert trigger of a Glorybringer . Moonlight Bargain - Such an amazing card, so underrated. 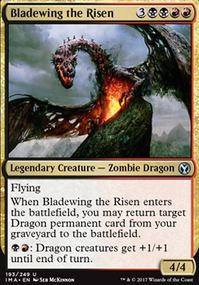 Until it's recent release in a commander product, I'd never seen it played by anyone else. Nissa Revane - The first planeswalker I pulled from a pack, and still my favorite planeswalker. Is she good? No. Do I care? No. The Great Aurora - Why does no one run a mono-green board wipe? This thing is fantastic. 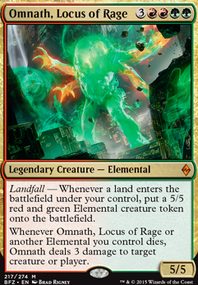 Ramp a bunch, float some mana, cast this, then rebuild your board before anyone else gets a chance. Archangel of Thune - Gotta represent my love of angels somehow, and this card is just a friggin' beast, easily one of my favorite cards. It's got it all - excellent art, good flavor text, and a game-ending ability. I've got a sweet stained-glass alter of one that looks absolutely amazing. Permeating Mass - It's my dream to one day build a Permeating mass first strike deck, with the goal being creating a field of as many permeating masses as possible. Someday. jordanalessi I said Dark Tutelage , Read the Bones , Moonlight Bargain , and gave many more options for casual games, ones with lower budgets, or more fun cards. Claiming a "Gotcha" when you don't read thoroughly the post is... umm... stupid. Yes. You are really dumb. Also, for the long games, Necropotence , Greed , and Ad Nauseam give a lot more value. Once you get into the general late game of turns 10+, a card like Necropotence as a top deck allows you to draw many more cards, and turn life into a full hand every following turn. 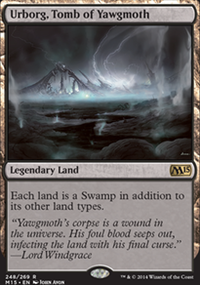 Unlike the more money expensive, worse Phyrexian Arena that wouldn't give that level of upside. Without your deck having a direction, it's hard to specify some suggestions for it. I've included suggestions for both commander staples and cards that'll work well with Muldrotha as a commander. Shinwizzles on Marchesa, the Black Rose EDH: Steal Yo Gurl! I_TappedWrong, I chose Greed over Arguel's Blood Fast Flip specifically because of the higher per-turn cost of the latter. Sure, it may only be one mana, but that one mana might be the difference between me drawing an extra card that turn or not. Greed does have a higher initial cost, but it seems worth it to cut the per-turn cost down to one. I'm not seeing the advantages of Moonlight Bargain over Phyrexian Arena . I don't really need to wait for the Phyrexian Arena to become profitable, since it starts netting me an extra card the turn after I play it. Moonlight Bargain is a one-time use card, whereas Phyrexian Arena sticks around until someone decides to deal with it, potentially causing someone to waste some removal. 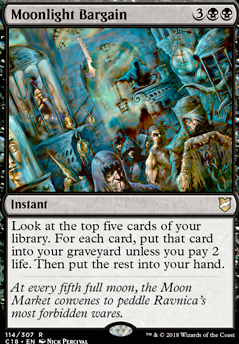 If there was an enchantment that had wording along the lines of Moonlight Bargain I would consider including it in the deck, but I don't think that particular instant is going to find a slot. As for the talismans, they don't seem as versatile as the signets. I'd be hard-pressed at times to choose between the two options a talisman provides, versus just filtering another color through a signet and getting two colors back. I like the fact that the talismans cost life to activate though, so I may run a few games with the signets swapped for the talismans to see how they perform. Thanks for the suggestions! I look forward to testing out any edits I make to my deck. I_TappedWrong on Marchesa, the Black Rose EDH: Steal Yo Gurl! any reason why you choose Greed over Arguel's Blood Fast Flip? i know its 2 cmc to activate but its a 2 drop and would help round out your CMC curve sense you have a large number of 4 and 3 drops. i would also consider running Moonlight Bargain over Phyrexian Arena i know it seems crazy but phyrexian arena takes so long to become profitable. i would also consider running Talisman of Dominance and Talisman of Indulgence over the Izzet Signet type cards. Solemn Simulacrum is just so good in this type of deck with a sac outlet. I too play a The Cranberries with an eyepatch - Gisa/Geralf EDH. Noosegraf Mob - great for zombie generation, a little pricey mana-wise, but if you are looking for 5 new 2/2 tokens, this works good. Vengeful Pharaoh - I love this guy, he stops people from attacking you while he is alive, and while he is in your graveyard. Moonlight Bargain - you can filter your zombies straight to the grave and keep anything you like the looks of.